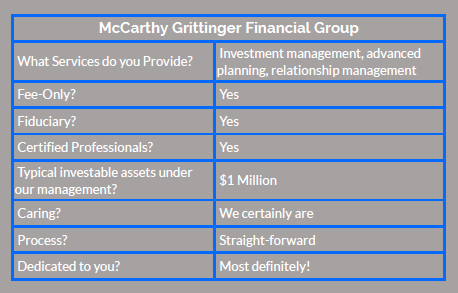 McCarthy Grittinger Financial Group (MG Financial Group) provides investment advisory and financial planning services for individuals and families. Our primary service is ongoing investment management that utilizes a financial planning approach. We may also provide general counsel to clients in the areas of financial, tax, retirement, insurance and estate planning. We serve individuals only – not institutions, endowments or retirement plans. We are an independent, fee-only, financial planning and investment advisory firm. Trust is paramount in our business and we take our fiduciary responsibility very seriously. At MG Financial Group, we take a highly personal approach with clients to build and nurture long-term mutually beneficial relationships. Many of our clients have faced a transition in their financial lives. Such catalysts might include traditional retirement, job change or loss, death of a spouse, divorce, inheritance, or sale of an asset or business. We strive to treat each client relationship in a trusting manner and help clients navigate through financial transitions. We believe our passionate commitment to our clients and their families is what clearly sets us apart from other firms. We understand that selecting the right financial advisor is an important decision for you and your family. We appreciate you taking the time to browse our website and believe you will find important details you need to help you in the decision-making process. Our in-house professionally credentialed advisors, consisting of Certified Financial Planning™ professionals and a CPA, have a deep knowledge of and commitment to their profession allowing them to assist clients with their tax and retirement planning. The CFP accreditation is recognized as the highest standard in personal financial planning.